Skymet has revised its February prediction of a normal monsoon. As per fresh estimates for the upcoming south-west monsoon, there is 55 percent probability of approximately 30 percent deficit in rains from June to September this year. Skymet Weather Services is a private Indian company that provides weather forecast and solutions in the country. The forecast also suggests chances of a formation of El Nino (heat wave) in the coming months given the warmer than the average Pacific Ocean. This has also been corroborated by the Australian weather department forecast which expects a 70 percent chance of an El Nino this year. 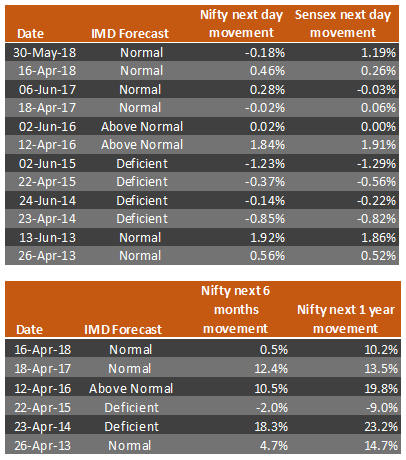 While there is a lot of talk around the monsoon projections, is the impact that significant on our economy, and thereby for the equity markets? Based on past trends, Skymet expects noticeable deviations between monsoon prediction and the actual monsoon performance. Moreover, even if overall monsoon have been within the predicted range, spatial and temporal distribution have a strong bearing on the actual impact of monsoons. Monsoons have a direct and a strong correlation of 76 percent with the country’s food production. The southwest monsoon lasts between June and September facilitating the major Kharif season of the country (July-October). These rains are a crucial source of water supply for agriculture. Nearly 75 per cent of India’s annual rainfall occurs during these four months. Monsoons are also a major source for water reservoir across the country. Rainfall towards the end of the monsoon season is crucial for water reservoir levels and soil moisture level which impact the Rabi seasons (winter crops) sowing and production. Rabi sowing typically starts in October. While theoretically, a deficit monsoon should suggest a low food production leading to an uptick in the food inflation due to a disequilibrium in demand and supply, both do not move in tandem always. Policy intervention measures by the government and stocking by traders have a strong role to play in the prices of the food grains. Agriculture forms around 15 percent of the country’s GDP and the rural economy have an important bearing on the overall growth in the economy. However, the direct risk to the economic growth of the same year because of deficient rainfall seems mild. Monsoon has a weak correlation with agri GVA and GDP growth rates of the same year. In fact, there have been years of deficit rainfall when the agri GVA has expanded. Nevertheless, it is interesting to note that the performance of monsoon has a very strong 93 percent correlation with the agri GVA growth rate of the subsequent year. This indicates the important bearing of monsoons on the cash flows in the rural economy which in turn impact the purchasing power and thereby sowing and rural demand in the following year. The reaction of the equity markets also calls for some attention and markets seem to be reacting in line with the monsoon predictions in the immediate short term. Deficit monsoon expectations have led to a muted or negative performance and normal to above average monsoon brings an uptick in the next day’s trade. However, this movement is more or less temporary and does not suggest any trend. Moreover, it seems to be getting weaker in recent times. In 2014, despite a forecast of a deficit monsoon, there was a strong Nifty uptick in the six months and the one-year period after forecasts (Actual rainfall: 96 percent). It is reasonable to assume that markets were driven more by sentiments as 2014 was an election year. 2019 in many ways may be a repeat of 2014. Even if rains turn out to be deficient in 2019, it is coming on the top of a near-normal last year and for the market, it is politics that may be calling the shots. Given the elections in the current year, we can expect a replication of this trend where markets might ignore the deficit monsoon until it hits in the broader level macro numbers. Performance of monsoon has an important bearing on India Inc. Directly or indirectly rural economy forms an important part of the earnings of Indian companies. Rainfall impacts crop output which in turn impacts the cash flows of farmers and rural demand. Agrochemical, seeds, agri inputs, FMCG, auto are few sectors which see a substantial impact. Owing to the dependency on monsoon, it does remain an important factor and has a substantial impact on agri performance. While rainfall has a direct impact on food production it does not always translate into a broader level impact in the same year. However, its impact on rural incomes does have a bearing on the following year’s macroeconomic growth. The temporary impact of the monsoon forecast on the equity markets is also worth noting. With the expectations of an El Nino in 2019, it is likely that the year might end in deficit rains. However, being an election year, sentiment can rule equity markets and markets might not react so soon unless the impact is significant and stands to hurt growth numbers for FY21.